The artist profile in the current issue of Quilting Arts (October/November 2014) features Lorie McCown. 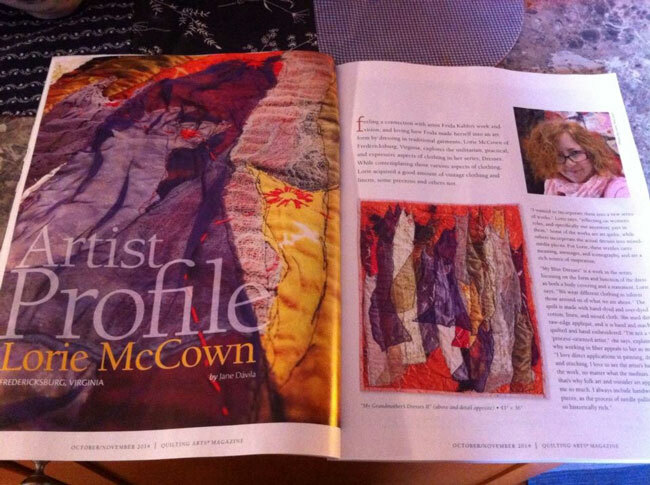 Lorie McCown is interviewed and featured in Quilting Arts Magazine latest issue. A five page article with many examples of her latest work is included. The article features the latest series she is working on and discusses processes, context and influences on her work. Lorie discusses the pieces meanings, messages, inspirations and iconography. The issue is on newsstands now. Lorie McCown’s work was included in Quilt National 2013.